As world championships was to have been the last race of De Vocht’s career, she officially entered early retirement. “The decision to retire didn’t come overnight. It’s taken me two years, in fact, to get here. Last year, I was all ready to stop but then I won the Belgian road championships. It was difficult pass up a whole year of riding in the peloton with that prestigious jersey. Now that I’m without the jersey I can easily say goodbye. At my age , I just want a house and a family, including kids. Luckily I already have a boyfriend so I am halfway there,” said De Vocht. Although her career was unexpectedly shortened by a month, her list of career accomplishments is anything but short. This year alone, she’s landed on the podium of UCI international events four times including a fourth in Omloop Het Nieuwsblad and second in the Belgian time trial championships. 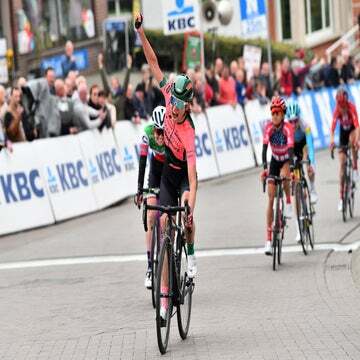 She’s also placed seventh in both Gent-Wevelgem and Tour of Flanders. Another accomplishment that ranks high for De Vocht was her debut in the 2012 Olympics. “In 2011, I quit my full-time job as a programmer to focus solely on cycling in hopes to qualify for the Olympics. Well, the gamble paid off as my dream came true. And a ninth place made it that much more special.” As there was only one automatic Olympic spot allocated to the Belgian women, De Vocht sacrificed her position on Marianne Vos’ Nederland-Bloeit team to ride for the Belgian Topsport Vlaanderen Team, where she could more easily earn valuable UCI points as team leader, as opposed to riding in support of Vos. With the additional points accumulated, Belgium was able to take two additional women, including De Vocht. 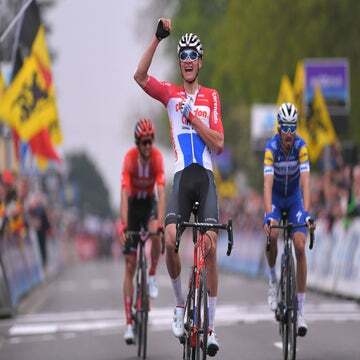 De Vocht got her first taste of the bike racing scene as a supporter for her brother, former professional Wim De Vocht, as well as ex-boyfriend Tom Boonen whom she dated from 1997-2003. She spent so much time on her bike at the races to get back and forth between start, finish, and feed zones that she began to see improvement in her own cycling. Once she and Boonen split, she became inspired to see how far she could get if she gave it a shot herself, starting off with the mountain bike before switching to the pavement.